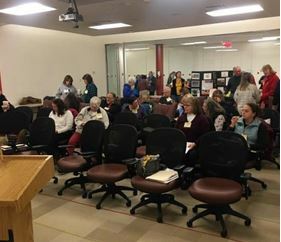 TROT’s recently formed Events Committee (Corinne Pouliquen, Meggan Whalen, and Carolann Sharpe) organized their first event for TROT members and other riders, an excellent “Trail Rider Safety and First Aid Seminar”. It was Saturday, January 12, in Germantown, and happily Mother Nature held the snow off until several hours after the event, so it could take place. This seminar was extremely informative, well-organized, and professionally run, with a great selection of speakers as well as a swell breakfast and lunch! 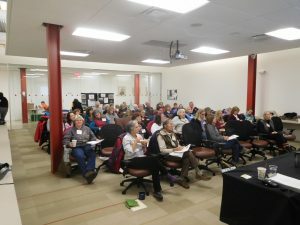 The Events Committee had to increase the initial capacity to 58 attendees to meet the high demand, showing that TROT members were longing for such informative events. 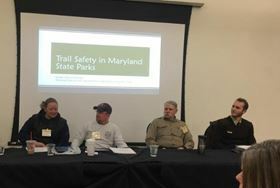 The morning talks started with Riley Schwengel, Park Ranger at Patuxent River and Seneca State Parks, who told us a lot of useful information about trial safety: the importance of planning ahead, including downloading the trail map onto your cell phone, taking along your cell phone (charged), a first aid kit (and what to have in it), a whistle, the 24/7 emergency number of the Natural Resources Police (410-260-8888; to use if help is needed), and lots more. The next speaker was Darren Potter, in conjunction with his spouse Heather Hardesky, both EMTs (Emergency Medical Technicians) who provided a lot more useful information on what to have in a first aid kit in your trailer and a smaller one with you on the horse (in your fanny-pack, not in the saddle-pack, in case you and the horse get separated!) and on dealing with emergencies. It was nice to hear his accolades to duct tape and baling twine, and the commendation of using soil to temporarily pack a wound! Next was another very interesting talk by Larry Raskin, who has decades of Search and Rescue expertise, including with TROT-SAR. He reinforced the importance of taking along what the previous speakers had advised; also flagging tape to locate a site and a 55 gal plastic bag as an emergency rain poncho/shelter for warmth. And the importance of knowing YOUR horse’s vital signs (temperature, heartbeat, breathing rate); also teaching your horse to lead/be led and to tie on a picket line; and the importance of STOP (stop, think, observe, plan); plus lots more. Neil Agate, President of the Maryland Horse Council, gave a final short talk before lunch, telling us multiple useful things related to the MHC, including that they have taken over the Equiery, and about upcoming events. 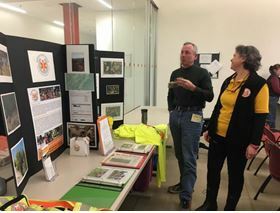 Neil also reminded TROT members about METS (Maryland Equine Transition Service; see article in the July 2018 TROT newsletter). 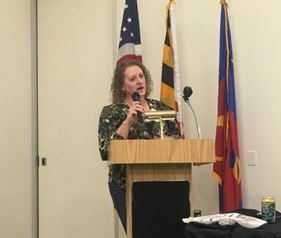 After a yummy lunch and socializing, we heard from Priscilla Huffman (past TROT President and current Baltimore Coordinator) and Jo Ann Bashore (retired DNR park ranger at Fair Hill) on the Volunteer Mounted Patrol (VMP; see past TROT newsletters for articles on the VMP and how to join). The next talk was from Dr. Kerry Murphy (DVM — UC Davis; now of Clover Vet Service in Eldersburg), clearly a superb vet who provided a lot of extremely valuable veterinary information that I will not try to recount, except to mention the danger of using both Bute and Banamine together (markedly increases the chance of ulcers) and the value of “sugardyne” (sugar-saturated betadyne, to draw out wounds). The final talk was from Kathleen Tabor, Esq., a lawyer with great expertise in equine-related law and a real knack for making intelligible to mere mortals many arcane-seeming legal matters that actually are very important to us horse-owners (such as “contributory negligence”, “good Samaritan laws”, “attractive nuisance doctrine”) and lots more. After a robust Q and A, the seminar adjourned, with everyone feeling it was a super well-spend day. The Events Committee deserves LOTS of kudos! They clearly did a great deal of work to put on this seminar for us, not only arranging the swell speakers, the room, the food, the registration, etc, but also putting together a helpful hand-out folder for everyone. Kudos also to Neil Agate, President of the MHC, for kindly arranging for the excellent facilities. Thanks SOOOO much! Keep an eye out for details on TROT’s next event, a Bombproofing Clinic.